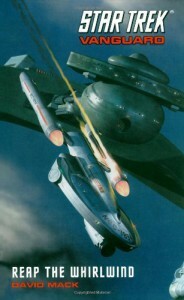 Reap the Whirlwind is the third book in the Vanguard series of “Star Trek” novels. For those who may have missed earlier reviews of the previous novels: Vanguard is a Federation starbase in the Taurus Reach, a region of space between the UFP, the Klingons and the Tholians. Several years before the opening of the initial volume – Harbinger Star Trek Vanguard 1 – Starfleet discovered what it calls the meta-genome, clear evidence of an incredibly advanced race that had once dominated the region. Under cover of colonization and exploration efforts in the region, the crew of Vanguard attempts to unravel the meta-genome’s mysteries before the “bad” guys can get their hands on them. (Here, we must have faith that the Federation will use the knowledge with wisdom.) Unfortunately, Starfleet’s interest in the region draws the attention it wished to avoid from both the Klingons (who are there, initially, because they have a general policy of interfering with the Federation when they can) and the Tholians (who have a history with the original inhabitants of the region, the Shedai, they are desperate not to reveal). As with the first two books in the series, this is pretty good “Star Trek.” Mack again shows his versatility as an author. His action scenes crackle and are well paced, though nothing as good as the Tholian ambush of the Bombay in Harbinger. And that skill continues with the novel’s down times – they’re important to the story and they don’t overstay their welcome. The chief weakness of the novel is that for too much of it the Federation et al. are on the sidelines, watching two factions of the Shedai vie for dominance and trying to avoid becoming collateral damage. On the plus side, Mack contrives to neutralize the overwhelming superiority of the aliens, paving the way for making the characters the focus of subsequent novels. The series continues to lack a strong emotional connection for me. No character has really connected. For which I blame the number of characters; there are too many foci and little time for measured character development. Too often, Mack and his collaborators rely upon telling us something has changed rather than following through with it in the story. I’m still following the series more for the solid story-telling in a milieu I like than for any other reason. (2) There’s also a nice scene where Mack captures why the Federation is the “good” guy and preferable to the Klingons, regardless of how “cool” and “honorable” Worf is: A group of Tholians have been captured and are being tortured by the Shedai. A Federation officer convinces the rebel Shedai to free them because it’s the right thing to do despite Tholia’s hostility to the Federation and even though it’s unlikely the Tholians would be so magnanimous were the situations reversed. It’s nice to see that optimistic side of the future that TOS captured better than any of its children – We can be better people than we are now. PS - There's a handy mini-encyclopedia of characters in the back of this book but be warned - it contains spoilers. Don't peruse it till you've finished the novel.